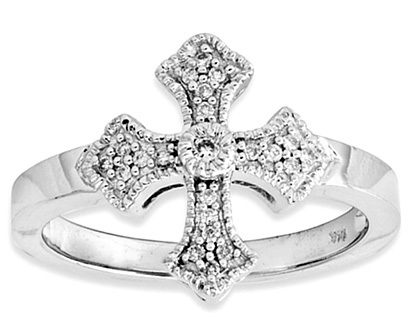 Fancy diamond cross ring for women crafted in 14k white gold with 0.11 carats of diamonds. Diamond Color: H-I, Clarity: I1. View our collection of quality Women's Christian Rings. Apples of Gold Jewelry guarantees the Fancy Diamond Cross Ring, 14K White Gold to be of high quality and an authentic engagement ring with real diamonds, as described above.